At the northern tip of New Hampshire you'll find the headwaters of the mighty Connecticut River. Starting as a trickle near the Canadian border in Pittsburg, NH, the river forms a chain of lakes, the Connecticut Lakes, before making it's 400 mile journey to Old Saybrook, Connecticut. The Connecticut Lakes are deep, cold-water lakes, home to lake trout and landlocked salmon. The river itself holds native brook trout, rainbow trout, and large brown trout. Landlocked salmon make their way into the river during spring spawning runs of bait fish and during their fall spawn. 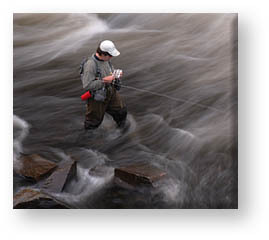 The river has fly-fishing only regulations on five miles of river. Most of the river is open to lure and bait as well. Two tail-water dams provide cold river water for miles downstream making summer fishing on the Connecticut River excellent. Remote ponds with good brook trout populations, some with fly-fishing only regulations, dot the wilderness and are accessible by car using well maintained logging roads. Diversity and abundance of quality fishing water make Pittsburg, and the Connecticut Lakes Region a favorite fishing destination. Ice out in the spring of the year begins our fishing season. Typically during the first week of May, ice will leave the lakes. Smelt and other baitfish spawn in the spring and it is their spawning which triggers the first of two landlocked salmon runs on the Connecticut River. Bait fish from the lakes enter the river with the salmon right behind them. This generally occurs about a week after ice out, perhaps less, and continues for two to three weeks depending on spring river flows. Area ponds fish well for trout shortly after ice out. Moose Pond, Middle Pond and Back Lake can be quite good in early and mid-May. By Memorial Day weekend the salmon run is waning but the trout fishing on the legendary Connecticut River is heating up! Streamer and nymph fishing is productive with the occasional Blue Winged Olive hatch occurring on warm, spring afternoons. June sees the first of a long series of Caddis hatches. Fishing in June is very good throughout our region. The big lakes fish well trolling for large lake trout and landlocked salmon. Ponds, both fly fishing and open regulation are excellent spots for brook trout while the river fishes well for Rainbow, Brook an d Brown Trout as well as young Landlocked Salmon. Spring is a great time to be here! We are blessed to have two, large tailwater dams on our river system. Water comes from the bottom of these dams, keeping our river water cool all summer long. What does this mean for the fishing? It makes it great all summer long! Fishing below the First Connecticut Lake dam is ‘fly fishing only’ and is home to Rainbow, Brook and Brown Trout as well as young Landlocked Salmon. Hatches of Caddis, Stoneflies and several Mayfly species keep the dry fly action happening all summer long. Below Lake Francis it is open regulation fishing with the area’s coldest river water. Murphy Dam’s bottom release keeps river water cold for miles down stream. 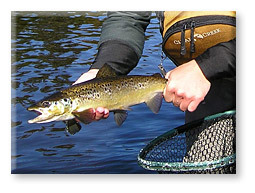 Fishing is good using lures and bait as well as caddis and mayfly patterns. The ponds and lakes are best fished in the early morning or just before dark when the water is the coolest. Fishing during the summer is a very pleasant pastime. The weather is warm and the area is beautiful! Summer is a great time to be here! Here in NH’s North Country, fall comes early. Our leaves start to change just after Labor Day and peak during the last two weeks of September. 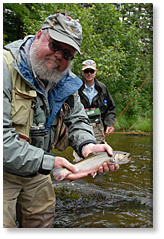 The change of seasons brings cooler water temps, blue winged olive hatches, the salmon spawn and great fishing! Trolling on the big lakes is productive for large Lakers and Landlocked Salmon. Bait, lure, nymph and streamer fishing is good on the Connecticut River. Near the end of September, lake Salmon begin to enter the river for their fall spawn. Our big lakes close to fishing on September 30th but smaller bodies of water and streams and rivers remain open until October 15th. Some of the season’s largest fish are caught in the fall. Fall is a great time to be here!